This week I made. . .
Huh. I made some stuff. But no pictures. It's not often there is anything to do with boy on this blog, but this little guy is just too cute! From KoJo Designs and a tutorial!!! And from Little Treasures, this cute little doily top. Let's see what you have been up to. 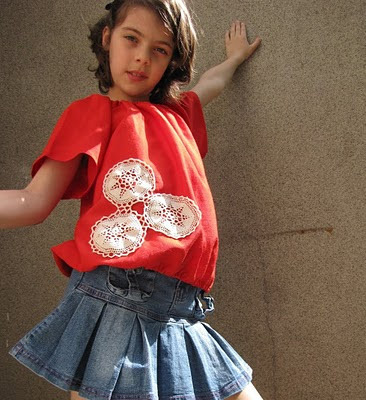 ** Needs to be something that is part of your/your kids wardrobe that YOU created. ** Link to your specific blog post, not just the main blog site. ** If you don't have a blog, link to your flickr pic and if you don't have a flickr account, you can email me your picture and I will add it for you. ** If you link up, you are giving me permission to feature your picture on my blog if I so choose. Yay! A button (it's about time!). Grab one, if you want. Thank you on the lovely comment you left for me! And for the feature, of course!